This time next week, many of us will be counting down the hours before we can kick back and enjoy a 4 day weekend. Don’t shout that too loudly to folk working in the hospitality industry – it’s likely to be 4 days of busy busy busy! As much as we’d love to be working, our deliveries and opening hours are determined by the couriers and their operating times. With this in mind, please find our opening hours and some advice about last order dates. 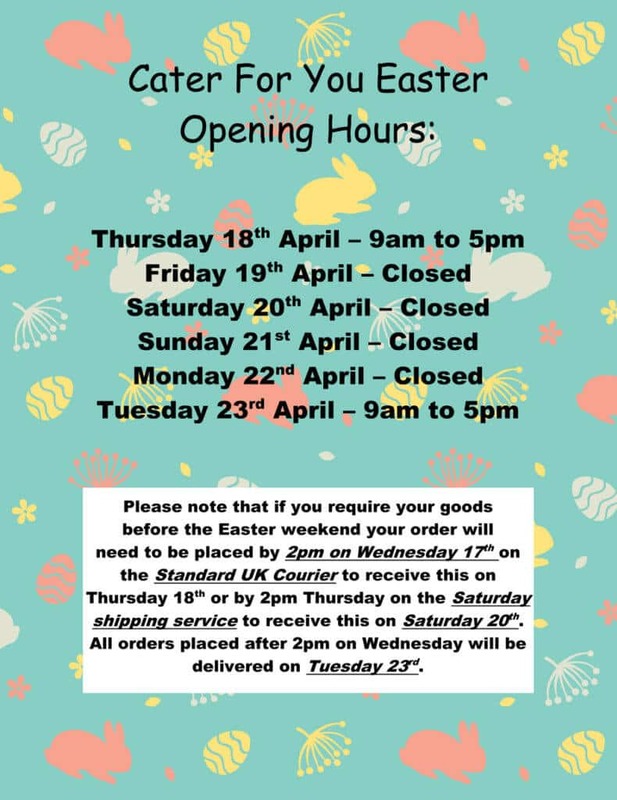 We’d advise that you order no later than lunchtime Wednesday, for delivery Thursday, selecting either Standard Courier, Next Working Day by 10.30am or Next Working day by 12pm at the checkout. This gives us time to despatch your order and also time to let you know if there are any issues that need working out. Large / pallet orders may need more time, so please plan ahead as our suppliers also close down for Easter too. Orders placed after 2pm Wednesday will be despatched on Thursday. There are Saturday services available at the checkout. The Standard Courier option would have your order out for delivery on Tuesday 23rd April. One final piece of advice we’d give is to make sure you enter a valid email address at the checkout so you receive courier updates.